Vermont's uneventful election season has no doubt prompted many a political junkie to hit the bottle in despair. Only a handful of top office-holders face major-party challengers and, of those, fewer still could charitably be called "vigorous." If you're not already four Gucci beers deep at the Three Penny Taproom, you've got at least one more opportunity to get sloshed on this year's low-key contests: tonight's final gubernatorial debate. Hosted by WPTZ-TV and taking place at 7 p.m. at the ECHO Lake Aquarium and Science Center, it'll feature Democratic Gov. Peter Shumlin, Republican Scott Milne and Libertarian Dan Feliciano. 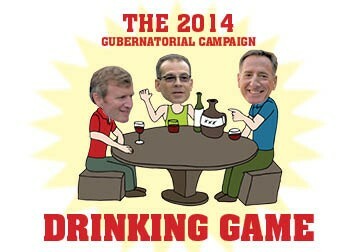 To help you along the path to political inebriation, Seven Days presents the 2014 Gubernatorial Campaign Drinking Game. Shumlin refers to his agenda as "bold," Feliciano calls himself a "turnaround expert" or Milne calls his a "campaign of ideas" — and then can't think of one. Milne cracks an awkward joke about his propensity to crack awkward jokes. Shumlin utters a noun, a verb and "Tropical Storm Irene." Feliciano's transition lenses go dark. Shumlin dodges a question. Or Milne answers a question both ways. Any of the candidates confuse Vermont Health Connect with single-payer. Milne answers a question about climate change by referring to Shumlin's "radical and reckless health care experiment." Shumlin tells Milne and Feliciano, "Cheer up, team. Quit preaching doom and gloom," and then flashes a double thumbs-up. Any of the candidates attempts to exploit an "epidemic" — Ebola, opiate or otherwise — for political gain. Milne answers a question with a non sequitur involving a distant ancestor and an early 20th century Vermont politician. Shumlin promises to implement single-payer in 2017 — unless he decides it's a bad idea. Cris Ericson waltzes onstage in a pirate hat. Shumlin says he's trying to "match Montpelier's appetite for spending with Vermonters' ability to pay," because taxpayers aren't telling him, "Governor, I've got so much extra loot in my pocket, can you raise my taxes?" Any of the candidates employs the phrase, "'Agnostic', whatever that means." Shumlin says he can see New Hampshire from his house, or Milne forgets where he was born. Emily Peyton tosses a block of "hempcrete" onstage. Milne and Shumlin, who both own travel companies, debate how many days Shumlin has traveled out of state and why he travels around Vermont in a gas-guzzling SUV. Shumlin name-drops "Al Gobeille and the team." Feliciano promises to cut the state budget 30 percent by, well, he's a turnaround expert. Shumlin manages to cram Vermont's unemployment rate, GMO labeling and renewable energy jobs into the same sentence. Milne finishes an answer with, "My bad."